A level French students from The Sixth Form College, Solihull met up with old friends last week as the return leg of an exchange with a French partner school took place. Our students visited the Lycée Renaudeau back in February and this month saw 22 students from the French school visit Solihull. The French students stayed with a Solihull student and attended College with them, including working with our students to help prepare them for their French oral examinations. They also went on a variety of visits out of College too. Among the visits outside of College, the French group visited Cadbury World and had an official welcome with the Mayor of Solihull. 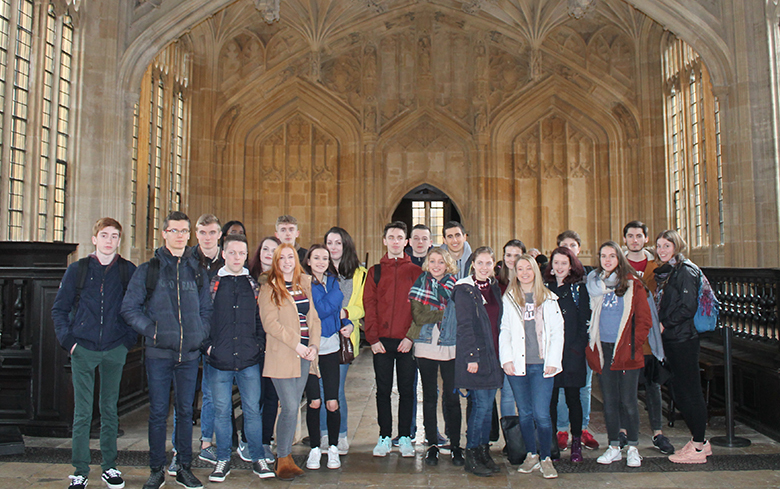 Both groups of students visited Oxford for the day during the exchange too, where they enjoyed a tour of the city including sights that had been used for shooting some scenes from the Harry Potter films. A visit to the Black Country Museum, Warwick Castle and Stratford were also some of the sights that the French students saw. The visit culminated with all the students going to a local restaurant, where the French students were exposed to fish and chips with bread and butter on the side!